Present were: Mayor Wagner, and Council members Shea, Fox, Khan and Kuo. The mission of the Greater Irvine Chamber of Commerce is the economic advancement of, and generating money for, Greater Irvine. The Chambers’ programs include “Destination Irvine” marketing, advocacy in government affairs, a master plan committee involved with future growth development in Irvine, improvement of the hotel district, programs to attract and mentor large and small businesses. Khan asked the Chamber of Commerce to provide more services and support for small businesses. The general fund is growing with sales tax and property tax being the primary source of revenue. The income from sales tax is decreasing but the property tax income is increasing. There is an increase in infrastructure needs for installation, repair and maintenance due to aging of the city and growth of the city. Due to the increase in population there has been an increase in staffing. The police department has been increased due to increased demand. There has been a 20 % increase in development related fees. Neighborhood meetings are planned for obtaining residents’ input in developing the 5-year plans. Fox stated that Irvine cannot continue to build without maintaining Irvine’s infrastructure. Shea reported that Irvine is going through leaner years financially, and therefore, the funding to outside organizations may have to be reduced, as well as hiring more staff may be held back. Shea said that she is concerned about how the 20% increase in development fees affects the smaller developers. Kuo stated that there needs to be an emphasis on transparency to the taxpayers, and thus, there needs to be a way to reach out to and engage the community to get feedback. Kuo said that there needs to be more than having commission meetings that are open to the public. Public comment asked for project applicants to disclose which city council members and commissioners they have contributed to. Public Comment asked for recusal on agenda items related to projects associated with businesses that substantially funded their campaigns directly or through PACs. Public Comment recommended district elections to reduce candidates’ dependence on special interest funding. 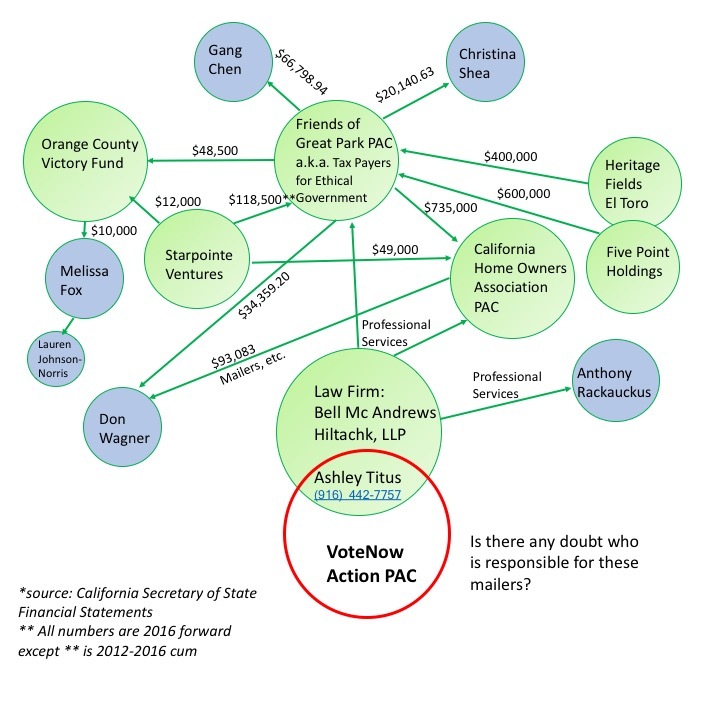 Commenter, who had a “follow the money chart” shown on the council chambers’ screen, requested recusal of Wagner and Shea on Heritage Fields Track Map agenda item because Heritage Fields substantially contributed to their campaign funds directly or through PACs. Shea responded by saying that Track Maps approvals are not appropriate items for recusals. She also stated that the interpretation of the campaign financing data presented on the chart is inaccurate. 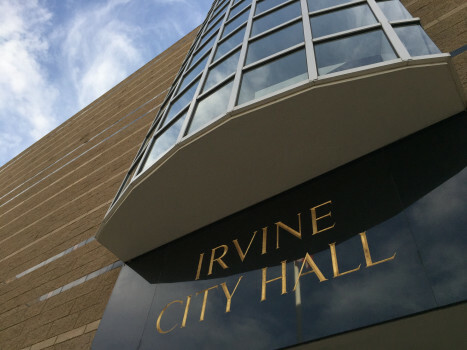 Kuo suggested that the Irvine Municipal code be amended because the requirement for a special election could cause delays in filling the mayoral position. The state law provides that the special election has to take place at specified times which could result in a long delay filling the position. Kuo suggested that the Mayor Pro Tem be appointed mayor, and if the Mayor Pro Tem declines, then a member of the City Council should be appointed. Kuo asked for direction from the City Attorney.